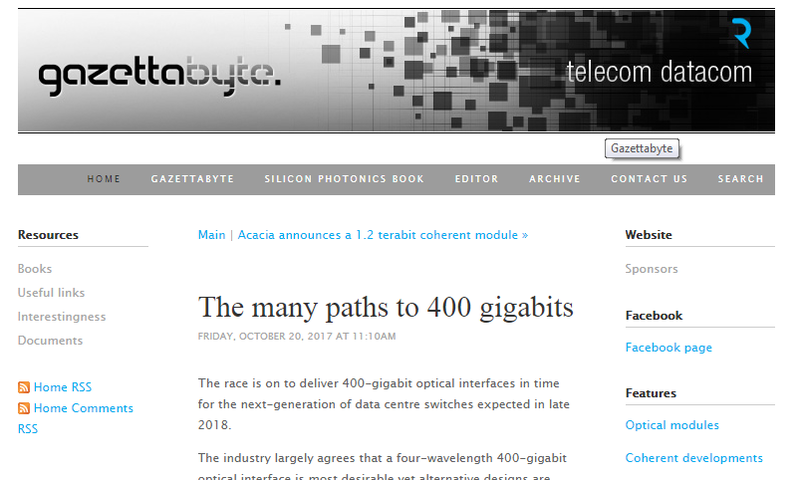 The race is on to deliver 400-gigabit optical interfaces in time for the next-generation of data centre switches expected in late 2018. The industry largely agrees that a four-wavelength 400-gigabit optical interface is most desirable yet alternative designs are also being developed. Optical module makers must consider such factors as technical risk, time-to-market and cost when choosing which design to back. Until now, the industry has sought a consensus on interfaces, making use of such standards bodies as the IEEE to serve the telecom operators. Now, the volumes of modules used by the internet giants are such that they dictate their own solutions. And the business case for module makers is sufficiently attractive that they are willing to comply. Another challenge at 400 gigabits is that there is no consensus regarding what pluggable form factor to use. One-hundred-gigabit interfaces are now firmly established in the marketplace. It took several generations to achieve the desired module design. First, the CFP module was used, followed by the CFP2. The industry then faced a choice between the CFP4 and the QSFP28 form factors. The QSFP28 ended up winning because the 100-gigabit module met the price, density and performance expectations of the big users – the large-scale data centre players, says Paul Brooks, director of strategy for lab and production at VIAVI Solutions. There is probably more technical risk in 400 gigabits than any of the historical data-rate jumps we have seen. It was the telcos that initially drove 100-gigabit interfaces, as with all the previous interface speeds. Telcos have rigorous optical and physical media device requirements such that the first 100-gigabit design was the 10km 100GBASE-LR4 interface, used to connect IP routers and dense wavelength-division multiplexing (DWDM) equipment. But 100 gigabits is also the first main interface speed influenced by the internet giants. “One-hundred-gigabit volumes didn’t take that inflection point until we saw the PSM4 and CWDM4 [transceiver designs],” says Brooks. The PSM4 and CWDM4 are not IEEE specification but multi-source agreements (MSAs) driven by the industry. The large-scale data centre players are now at the forefront driving 400 gigabits. They don’t want to wait for three generations of modules before they get their hands on an optimised design. They want the end design from the start. “There was a lot of value in having iterations at 100 gigabits before we got to the high-volume form factor,” says Ward. “It will be more challenging with the compressed timeframe for 400 gigabits.” Datacom traffic is driven by machine-to-machine communication whereas telecom is driven by consumer demand. Machine-to-machine has twice the growth rate. Brandon Collins, CTO of Lumentum, explains that the urgency of the large-scale data centre players for 400 gigabits is due to their more pressing capacity requirements compared to the telcos. Datacom traffic is driven by machine-to-machine communication whereas telecom is driven by consumer demand. “Machine-to-machine has twice the growth rate,” says Collins. The data centre players require 400-gigabit interfaces for the next-generation 6.4- and 12.8-terabit top-of-rack switches in the data centre. “The reason why the top-of-rack switch is going to need 400-gigabit uplinks is because server speeds are going to go from 25 gigabits to 50 gigabits,” says Adam Carter, chief commercial operator for Oclaro. A top-of-rack switch’s downlinks connect to the servers while the uplinks interface to larger ‘spine’ switches. For a 36-port switch, if four to six ports are reserved for uplinks and the remaining ports are at 50 gigabits-per-second (Gbps), 100-gigabit uplinks cannot accommodate all the traffic. The 6.4-terabit and 12.8-terabit switches are expected towards the end of next year. These switches will be based on silicon such as Broadcom’s Tomahawk-III, start-up Innovium’s Teralynx and Mellanox’s Spectrum-2. All three silicon design examples use 50-gigabit electrical signalling implemented using 4-level pulse-amplitude modulation (PAM-4). PAM-4, a higher order modulation scheme, used for the electrical and optical client interfaces is another challenge at 400-gigabit. The use of PAM-4 requires a slight increase in bandwidth, says Brooks, and introduces a loss that requires compensation using forward error correction (FEC). “Four-hundred-gigabits is the first Ethernet technology where you always have FEC on,” he says. The modules being proposed for 400-gigabit interfaces include the CFP8, the Octal Small Form Factor (OSFP) and the double-density QSFP (QSFP-DD) pluggable modules. COBO, the interoperable on-board optics standard, will also support 400-gigabit interfaces. The QSFP-DD is designed to be backward compatible with the QSFP and QSFP28 pluggables while the OSFP is a new form factor. At OFC earlier this year, several companies showcased 400-gigabit CFP8-based designs. NeoPhotonics detailed a CFP8 implementing 400GBASE-LR8, the IEEE 802.3bs Task Force’s 10km specification that uses eight wavelengths, each at 50-gigabit PAM4. Finisar announced two CFP8 transceivers: the 2km 400GBASE-FR8 and the 10km 400GBASE-LR8. Oclaro also announced two CFP8 designs: the 10km 400GBASE-LR8 and an even longer reach 40km version. The 400-gigabit CFP8 is aimed at traditional telecom applications such as linking routers and transport equipment. NeoPhotonics’ CFP8 is not yet in production and the company says it is not seeing a present need. “There is probably a short window before it gets replaced by the QSFP-DD or, on the telecom side, the OSFP,” says Ferris Lipscomb, vice president of marketing at NeoPhotonics. Finisar expects its 400-gigabit CFP8 products by the year-end, while Oclaro is sampling its 10km 400-gigabit CFP8. But the large-scale data centre players are not interested in the CFP8 which they see as too bulky for the data centre. Instead, Amazon, Facebook, and equipment vendor Cisco Systems are backing the higher-density QSFP-DD, while Google and Arista Networks are proponents of the OSFP. “The data centre players don’t need IEEE standardisation, they need the lowest cost and the most compact form factor,” says Lumentum’s Collings. To achieve 400 gigabits, the QSFP-DD has twice the number of electrical lanes of the QSFP, going from four to eight, while each lane’s speed is doubled to 56Gbps using PAM-4. “Time and time again we have heard with the QSFP-DD that plugging in legacy modules is a key benefit of that technology,” says Scott Sommers, group product manager at Molex and a co-chair of the QSFP-DD MSA. The power envelope of the QSFP-DD is some 12W. Yasunori Nagakubo, director of marketing at Fujitsu Optical Components also highlights the high-density merits of the QSFP-DD. Up to 36 ports can fit on the front panel of a one-rack-unit (1RU) box, enabling a throughput of 14.4 terabits. “A lot of people are trying to make everything fit inside a QSFP-DD but, after all, the OSFP is still a bigger form factor which is easier for different components to fit in,” says Winston Way, CTO, systems at NeoPhotonics. Should a 400-gigabit design meet the more constrained volume and power requirements of the QSFP-DD, the design will also work in an OSFP. The consensus among the module makers is that neither the QSFP-DD nor the OSFP can be ignored and they plan to back both. “We have been in this discussion with both camps for quite some time and are supporting both,” says Collings. What will determine their relative success will be time-to-market issues and which switch vendors produces the switch with the selected form factors and how their switches sell. “Presumably, switches are bought on other things than which pluggable they elected to use,” says Collings. Is having two form factors an issue for Microsoft? There are several 400-gigabit interface specifications at different stages of development. The IEEE’s 802.3bs 400 Gigabit Ethernet Task Force has defined four 400 Gigabit specifications: a multi-mode fibre design and three single-mode interfaces. The 100m 400GBASE-SR16 uses 16 multi-mode fibres, each at 25Gbps. The -SR16 has a high fibre count but future 400-gigabit multi-mode designs are likely to be optimised. One approach is an eight-fibre design, each at 50Gbps. And a four-fibre design could be developed with each fibre using coarse wavelength-division multiplexing (CWDM) carrying four 25-gigabit wavelengths. The three single-mode IEEE specifications are the 500m 400GBASE-DR4 which uses four single-mode fibres, each conveying a 100-gigabit wavelength, and the 2km 400GBASE-FR8 and 10km 400GBASE-LR8 that multiplex eight wavelengths onto a single-mode fibre, each wavelength carrying a 50-gigabit PAM-4 signal. The 2km and 10km IEEE specifications use a LAN-WDM spacing scheme and that requires tight wavelength control and hence laser cooling. The standards also use the IEEE CDAUI-8 electrical interface that supports eight 50-gigabit PAM-4 signals. The -FR8 and -LR8 standards are the first 400-gigabit specifications being implemented using the CFP8 module. A new initiative, the CWDM8 MSA, has been announced to implement an alternative eight-wavelength design based on CWDM such that laser cooling is not required. And while CWDM8 will also use the CDAUI-8 electrical interface, the signals sent across the fibre are 50-gigabit non-return-to-zero (NRZ). A retimer chip is required to convert the input 50-gigabit PAM-4 electrical signals into 50-gigabit NRZ before being sent optically. Proponents of the CWDM8 MSA see it as a pragmatic solution that offers a low-risk, timely way to deliver 400-gigabit interfaces. “When we looked at what is available and how to do an optical interface, there was no good solution that would allow us to meet those timelines, fit the power budget of the QSFP-DD and be at the cost points required for data centre deployment,” says Intel’s Blum. Intel is one of 11 founding companies backing the new MSA. A disadvantage of the MSA is that it requires eight lasers instead of four, adding to the module’s overall cost. This is what the 100G Lambda MSA aims to address with its four 100-gigabit wavelength design over duplex fibre. This can be seen as a four-wavelength CWDM complement to the IEEE’s 400GBASE-DR4 500m specification. The first 400-gigabit standard the MSA is developing is the 400G-FR4, a 2km link that uses a CDAUI-8 interface and an internal PAM4 chip to create the 100-gigabit PAM-4 signals that are optically multiplexed onto a fibre. “Everyone wants 400 gigabit – 4×100-gigabit, that is what they are looking for,” says Rajgarhia. If companies adopt other solutions it is purely a time-to-market consideration. “If they are going for intermediate solutions, as soon as there is 400 gigabits based on 100-gigabit serial, there is no need for them, whether it is 200-gigabit or 8×50-gigabit modules,” says Rajgarhia. “Everyone understands that, ultimately, the end game is the QSFP-DD but how do we get there?” says Viavi’s Brooks. 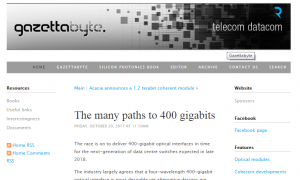 He describes as significant the challenges involved in developing a four-wavelength 400-gigabit design. These include signal integrity issues, the optics for 100-gigabit single wavelengths, the PAM-4 DSP, the connectors and the ‘insanely hot and hard’ thermal issues. “All these problems need to be solved before you can get the QSFP-DD to a wider market,” says Brooks. Lumentum’s Collins says quite a bit of investment has been made to reduce the cost of existing 100-gigabit CWDM4 designs and this investment will continue. “That same technology is basically all you need for 400 gigabits if you can increase the bandwidth to get 50 gigabaud and you are using a technology that is fairly linear so you can switch from NRZ to PAM-4 modulation.” In other words, extending to a 400-gigabit four-wavelength design becomes an engineering matter if the technology platform that is used can scale. Microsoft’s Booth is also optimistic. He does not see any challenges that suggest that the industry will fail to deliver the 400-gigabit modules that the large-scale data centre players require: “I feel very confident that the ecosystem will be built out for what we need.” Module companies backing the most technically-challenging four-wavelength designs face the largest risk, yet also the greatest reward if they deliver by the end of 2018 and into 2019. Any slippage and the players backing alternative designs will benefit. Read more about the VIAVI ONT-600 400G CFP8 solution or get the 400G Ecosystem infographic.